5. 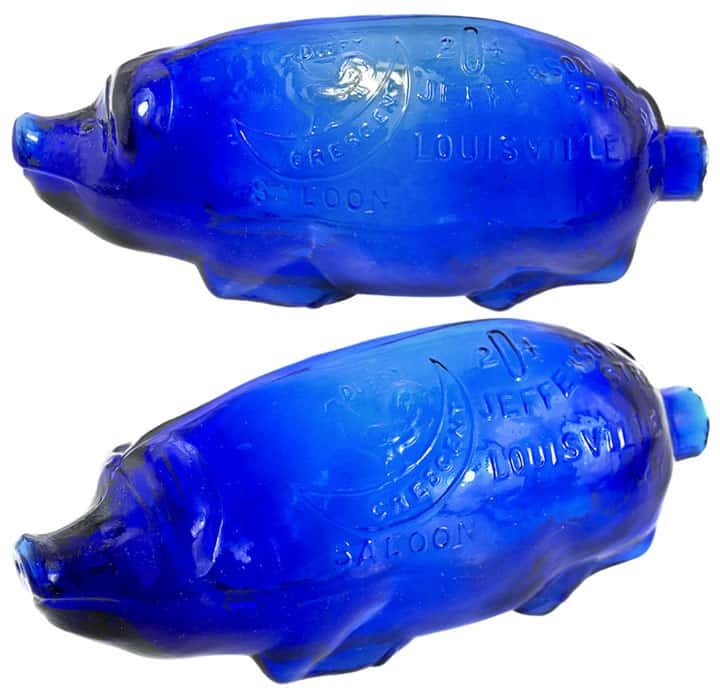 Cobalt blue ale or mineral water bottle shape embossed METCALFE BREWERY / LOUISVILLE, KY. 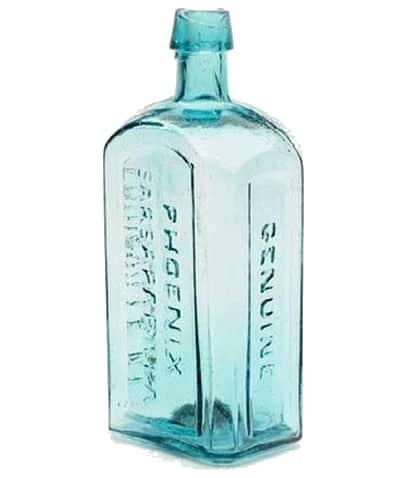 Probably about a quart and with an iron pontil. 6. 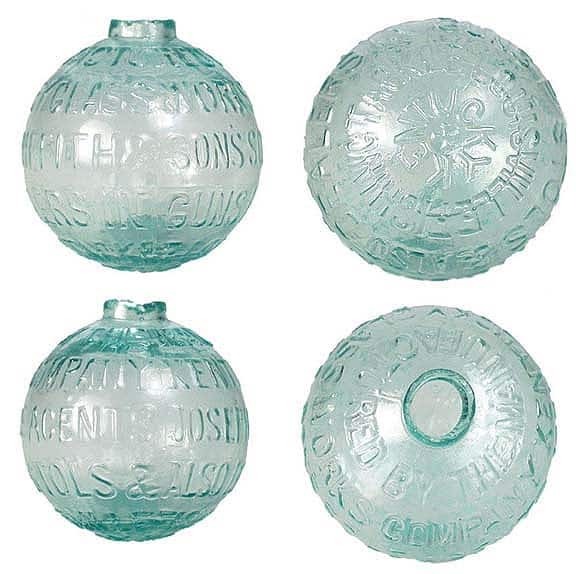 Aqua target ball embossed LOUISVILLE, KY. GLASS WORKS. 9. 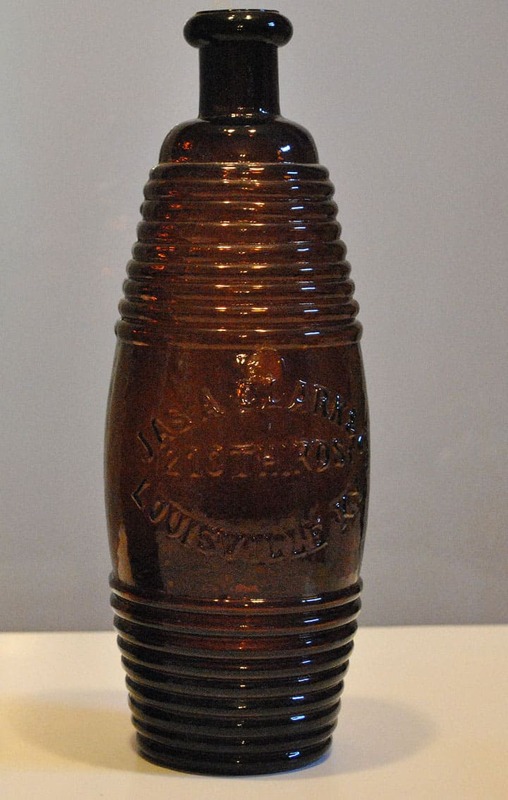 Green “John Bull Sarsaparilla-shaped bottle embossed GENUINE PHOENIX SARSAPARILLA / LOUISVILLE, KY. Pontiled. 10. 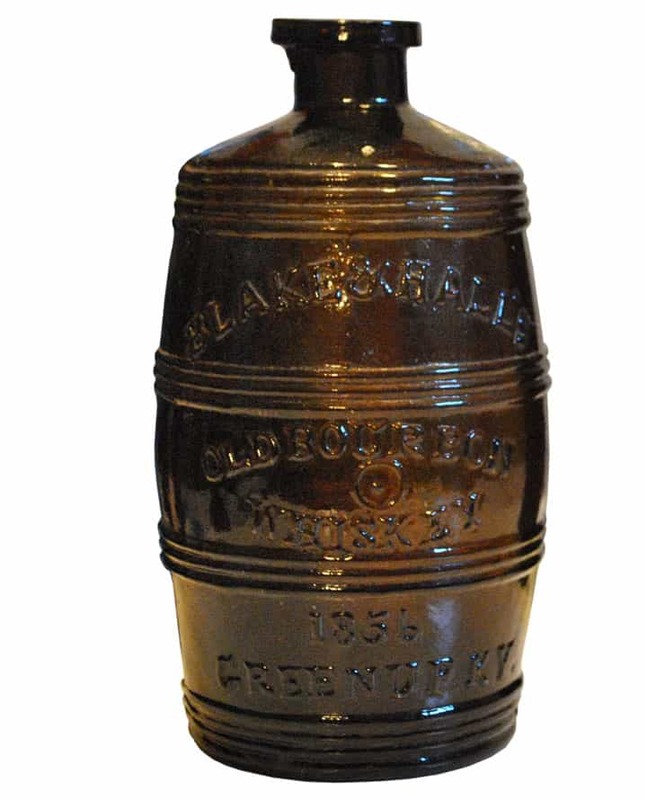 Amber whiskey tall and about a 5th in size, six-sided with an iron pontil and embossed KEENE & CO. / FRANKFORT, KY. 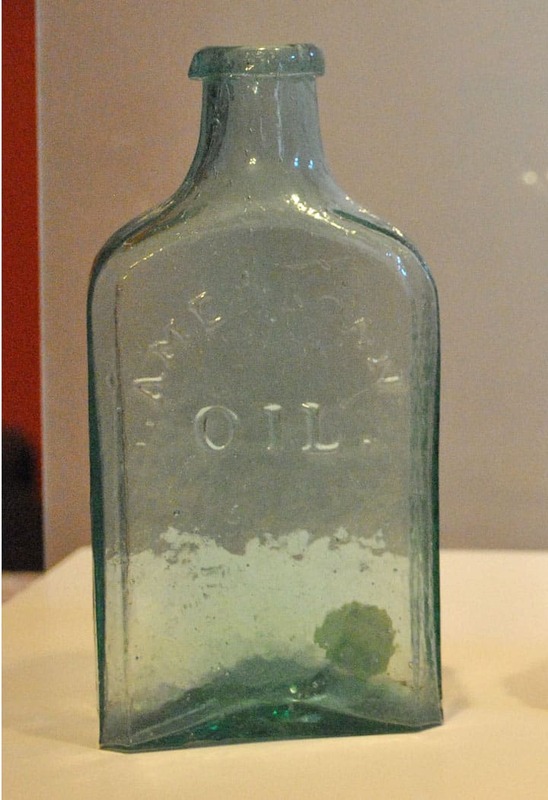 Bottle is full of seed bubbles. 13. 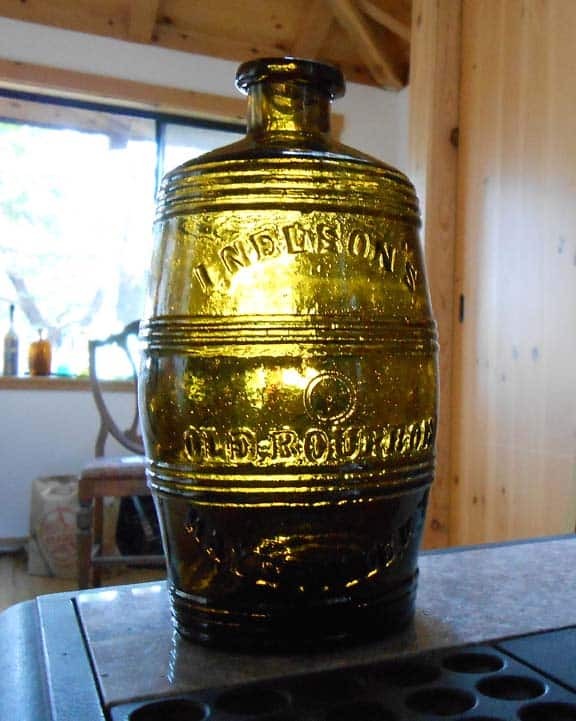 Amber triangular-shaped bitters bottle with embossed ribs on the sides. 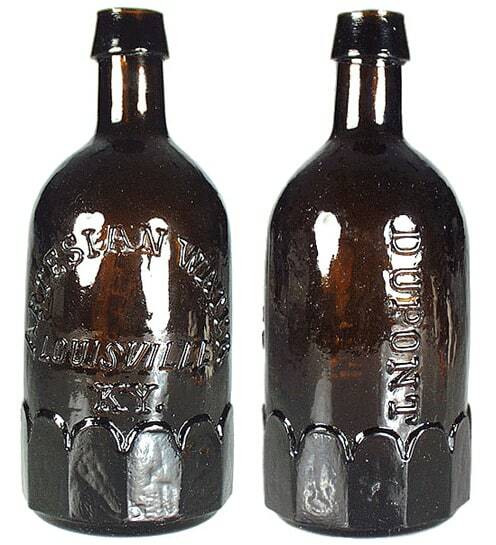 Embossed PASQUIER’S / FRENCH BITTERS / LOUISVILLE, KY.
15. 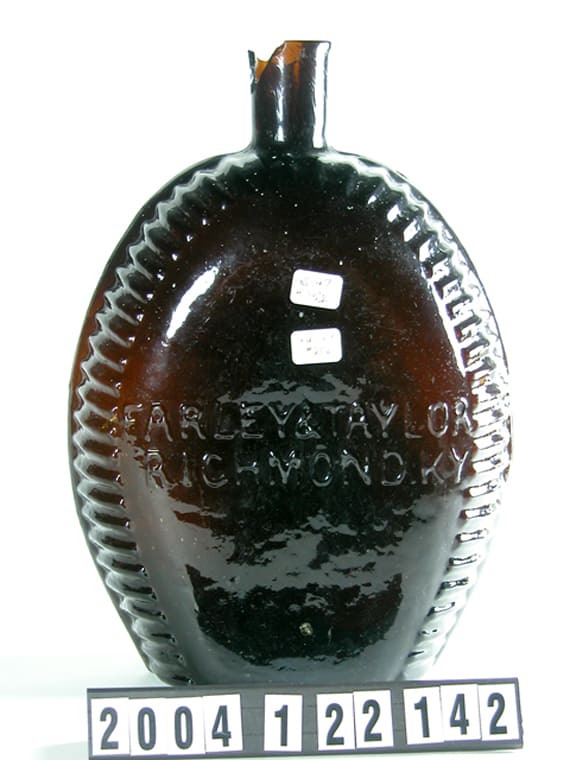 Amber octagonal lady’s leg bitters bottle embossed RIVAUD’S / COCKTAIL / BITTERS / LOUISVILLE, KY. A related bottle is very rare and is an amber square bitters embossed RIVAUD’S IMPERIAL BITTERS / VICTOR RIVAUD / LOUISVILLE, KY.
17. 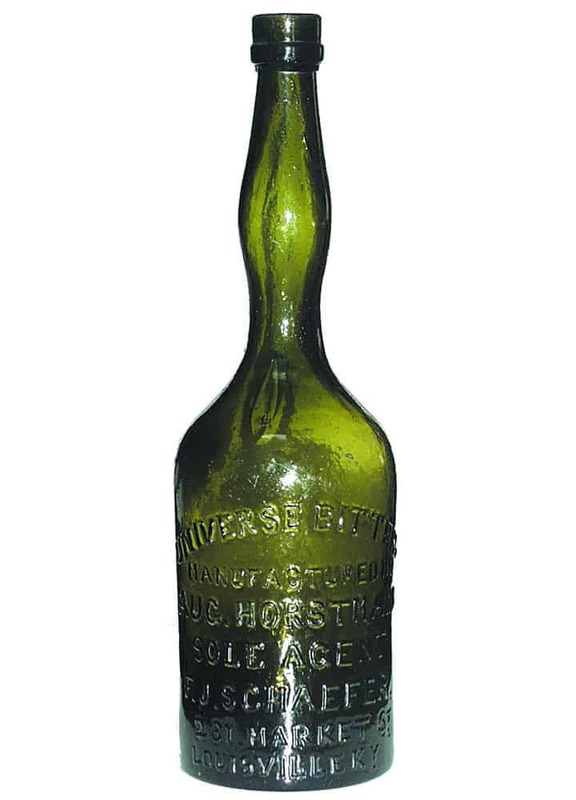 Deep emerald green bottle with iron pontil (slightly taller than most mineral waters) embossed T.E. JENKINS / PAROQUET / WATER / LOUISVILLE, KY. It has a tapered top with ring. Only one known in this color; one is known in teal. 18. 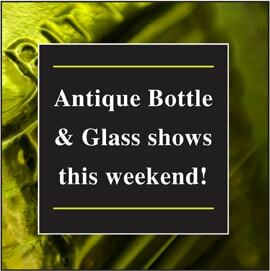 Aqua umbrella ink with open pontil embossed WALKER’S / LOUISVILLE, KY.
20. 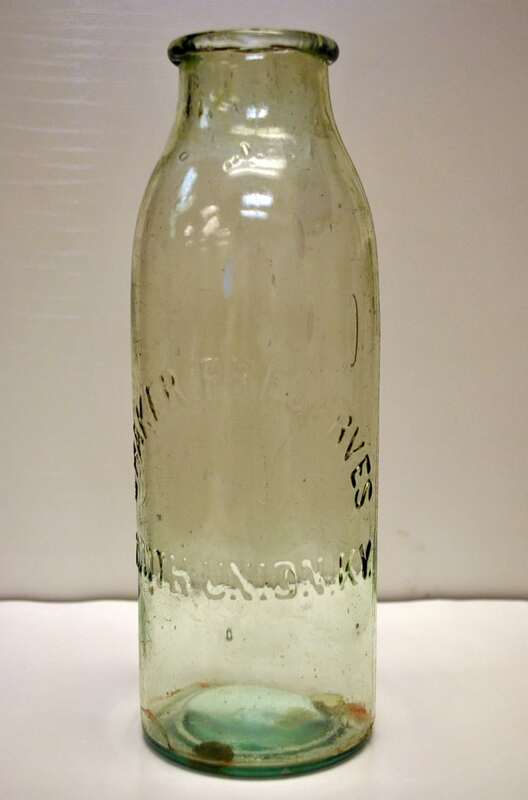 Green rectangular bitters bottle with smooth base, measuring approximately 9.5 x 3-3/8 x 2-3/8 inches and embossed O’MARRAS / FENIAN BITTERS / LOUISVILLE, KY. / J.B. WILDER & CO.
21. 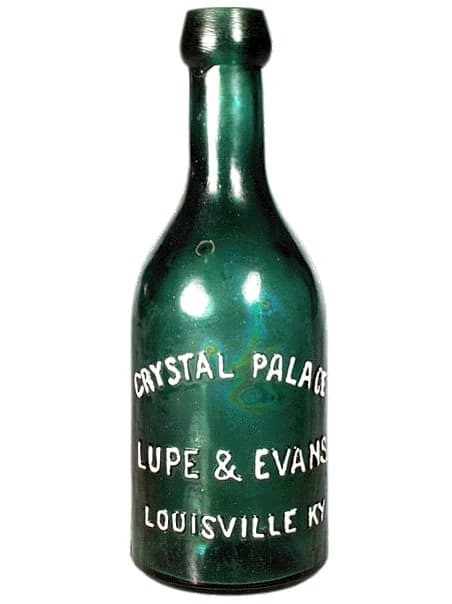 Half-pint deep green historical flask (GI-33) embossed LOUISVILLE, L KY. / GLASS WORKS on one side. 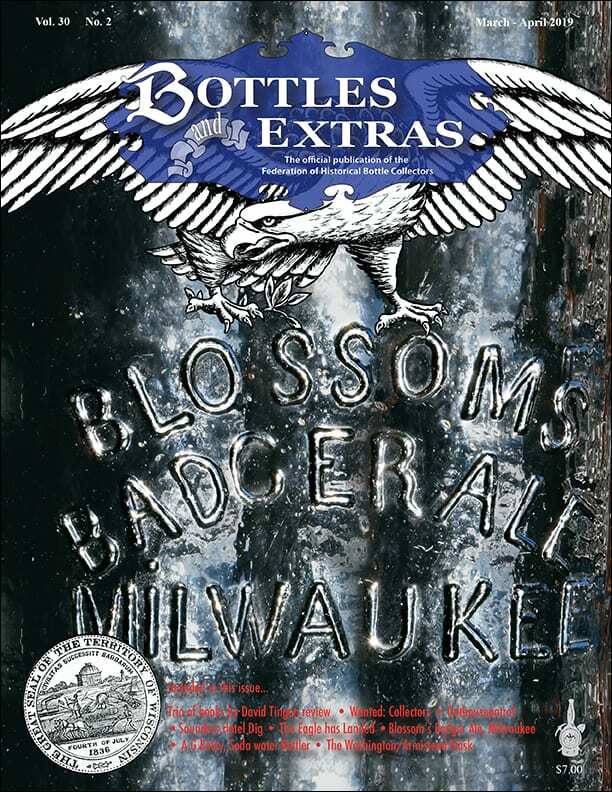 The other side embossed with an American eagle with talons, five embossed stars. 22. 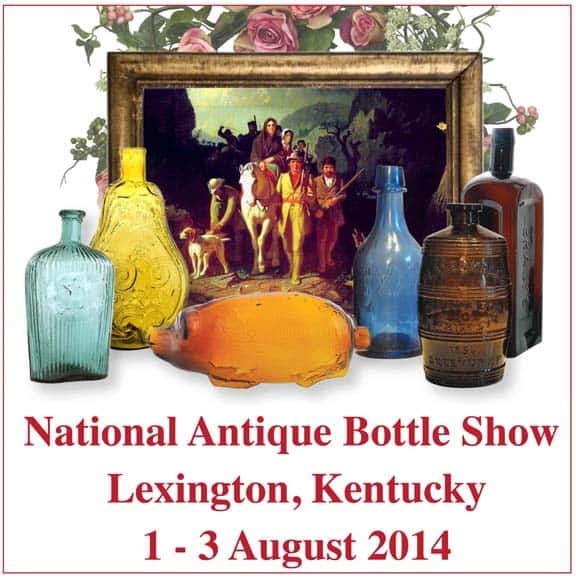 Yellow to citron open pontil rectangular medicine embossed S & S / MAYSVILLE, KY.
24. 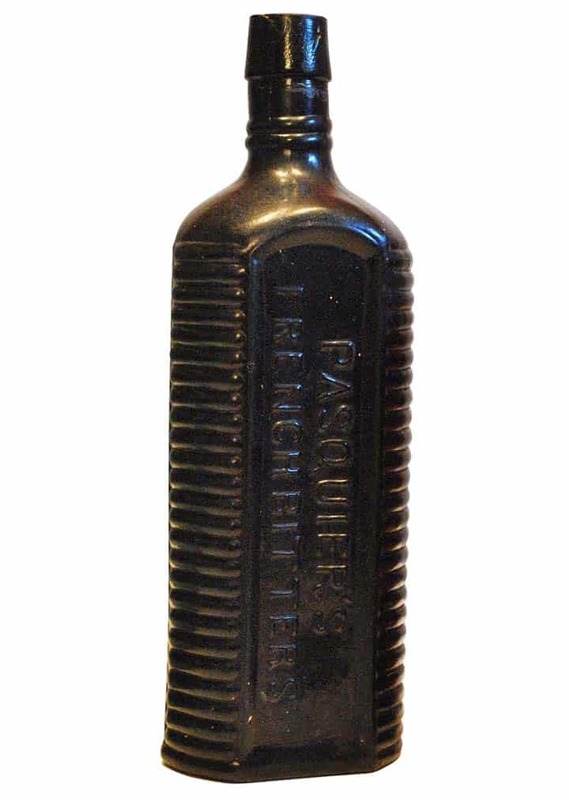 Tall black glass bottle with seal embossed T. RUCKER / LOUISVILLE. Seal is placed on top just below shoulder. 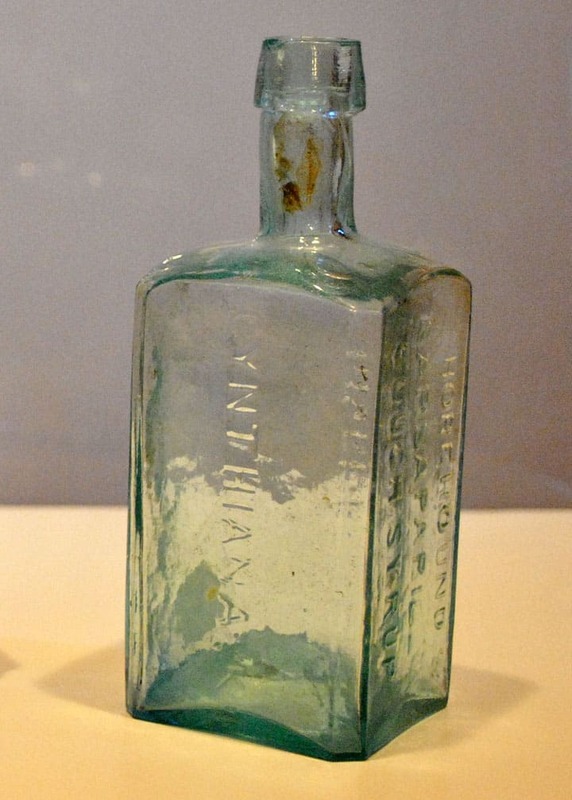 Probably one of the oldest known Kentucky bottles, it was dug in Louisville during the early 1900s.